Start there and refer back to here when needed. This guide is intended to help users configure 3D playback launched from Kodi and return to Kodi when finished, automated and enhanced as much as possible at this time. I have gathered and created this info from many sources, too numerous to name. It is their contributions who also make this possible. Kodi does not completely support 3D playback yet so, we rely on 3rd party software and scripts to fill the void. These instructions should help aid you to adapt to your system dependening on the software and hardware you use. I am providing examples from my Windows 8.1 with TotalMedia Theatre although I have upgraded to Windows 10 Pro using PowerDVD with an Nvidia GPU and one 3D panel although a 2nd monitor can also be used with further adjustments as can Intel users. This is remote control friendly in every way. I use a Harmony 900. This is completely compatible with Helix, Isengard and Jarvis. I am presently using KODI LEIA x64 v.18 successfully with no problems. Download Virtual CloneDrive (VCD) and install http://www.slysoft.com/en/virtual-clonedrive.html Any virtual mounter will work but the code will need modifications to work. I have assigned drive letter 'A' for the virtual mount but you can assign what you prefer. Navigate to Administrative Tools/Computer Management/Disc Management. On the bottom graph, locate the virtual CD-ROM, right click it, select 'Change drive letter and paths'. Select change. On the right is a radio button that reveals available drive letters. Be certain any external drives are on as Windows will make their letters available if they are off and not present. 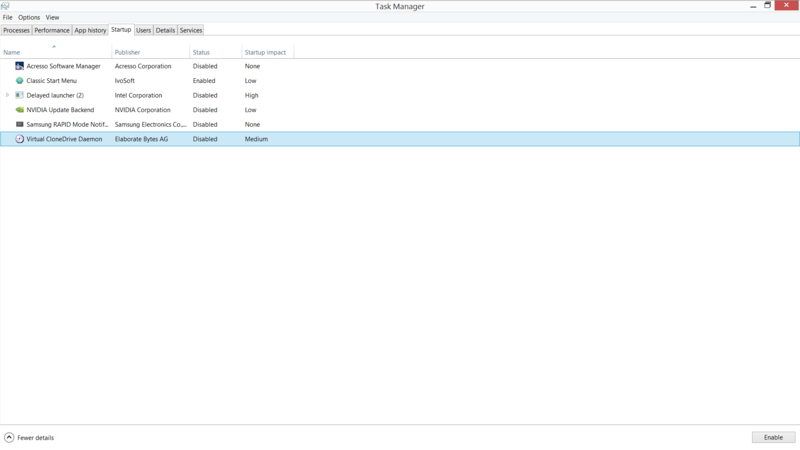 Disable VCD in Task Manager/Startup since there is no need for it to appear in the tray nor load at startup. Install latest Nvidia drivers including 3D Vision driver. You probably will not need the 3D controller driver. 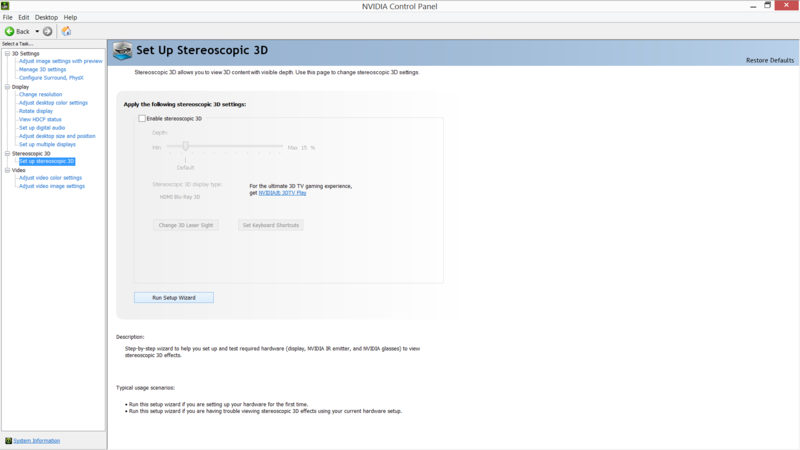 Open Nvidia Control Panel/Setup Stereoscopic 3D/Run Setup Wizard. This confirms left/right eye and that your panel auto switches into 3D mode since the wizard enables Stereoscopic in the control panel. When finished, change resolution to HD 3D 1080p 1920x1080 set at 24Hz and apply. Now select Ultra HD 1080p 1920x1080 (native) 60Hz and apply. Uncheck 'Enable Stereoscopic 3D' and save. *Note* 3DTV Play is not required. Install Intel Graphics Control Panel, Select 3D and enable if there is an option. As with Nvidia, it is part of your Driver package and accessed via the Windows program menu. Windows Screen Resolution, Check Enable Stereoscopic 3D Settings for all Supported Displays and save. Follow the rest of the guide using these edits. In Windows Screen Resolution, check Enable Stereoscopic 3D for all supported displays for single panel users . 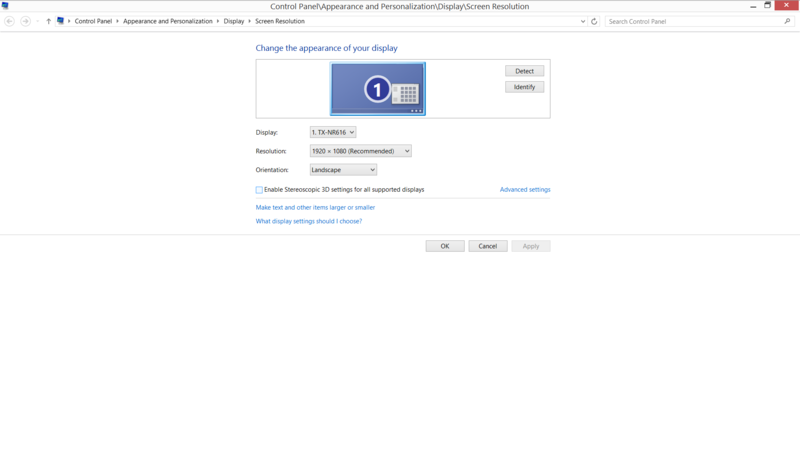 If you are running dual monitors of different resolution enable stereoscopic settings for all 3D displays' in windows screen resolution settings. You won't see this setting unless you make your secondary monitor (TV panel for playback) the primary monitor and turn off monitor 1 by selecting 'show desktop on monitor 2 only' since this is the 3D display. This becomes a problem for ease of use though. The fix is win+p and 'select pc screen only'. Next, right click your taskbar and select properties. There should be a setting to show taskbar on all displays or only the main display. You don't want a taskbar on your Kodi display. The setting is at the bottom in the Multiple Displays section. You only set this 1 time so it's set and forget. Once you set select pc screen only, windows will automatically switch between the two and turn off the one not in use, turn it back on when it is. So, you can be using monitor 1 for pc stuff and when you want to watch a movie on your TV panel (monitor 2), when you turn on monitor 2, monitor 1 turns off. This means windows has now auto set monitor 2 as primary and the windows resolution setting 'enable stereoscopic settings for all 3D displays' is present and enabled. When you turn off monitor 2, monitor 1 automatically turns back on. Once this is set up, Uncheck 'Enable Stereoscopic 3D for all Supported Displays, save and exit. I highly suggest you enable Samsung Auto Motion Plus in your panel settings (Blur Reduction max and Judder 50% aka Smooth). This is why you purchased a 240Hz model http://support-us.samsung.com/cyber/popu...N46C750R2F Most panels have this feature using a similar name; Motion Flow, TrueMotion, etc. This enhances clarity greatly in my opinion and is mainly for 2D playback. When enabled with panel in 3D mode though, the set will overscan and aspect ratio is wrong. So it must be set to 'Standard' or 'Off' when rendering 3D. Rather than digging through the panel menu to enable or disable depending on 2D or 3D content, you can automate it with proper hardware. If your AVR has dual output, HDMI out of AVR to one of your panels HDMI inputs and use this source for 2D. Most panel HDMI inputs can be adjusted independent of other inputs so in the panel menu set Auto Motion Plus to 'Smooth' and any other adjustments you desire for 2D playback. HDMI out of your AVR 2nd output and HDMI in to a different HDMI input on your panel. Use this source for 3D and set Auto Motion Plus to Standard or off and tailor any other adjustments for 3D playback. If your AVR does not provide dual output, you could probably attach an HDMI splitter out of the AVR to your panel. I assign a soft button on my remote for the panel 3D source and select it when I playback 3D. Install your external player of choice. I use PowerDVD 15. I prefer using VCD to mount and avoid PDVD internal iso mounter. Be sure to enable Match Refresh Rate. Select Default Audio/Original Primary Source. This enables Passthrough. Enable Full Screen. Assign alt+f4 to a convenient button on your remote. I use a Harmony 900 and also assign it when exiting an activity (Kodi). You will need this to exit your external player and return to Kodi after playback. If using a mouse, just close the external player. If you have already set up your remote to control Kodi, some of these settings will carry over to external players and are sufficient although they were designed for a mouse. VCD will always dismount once external player is closed. If you fail to render 3D sometimes, pressing pause and then play again should remind PDVD to render 3D. Optionally, you may want to install SlySoft AnyDVD, DVDFab Passkey, or the likes. There have been rare occasions I opted to use it and it offers more enhancements should you decide to incorporate any of them. In Windows Audio Properties, be sure to configure your sound with your AVR on and not in standby. It's also a good place to check the supported formats enabling you to select the same in Kodi Audio settings. This ensures Kodi shakes hands with your audio device properly and does not hinder video playback due to conflicting audio settings. 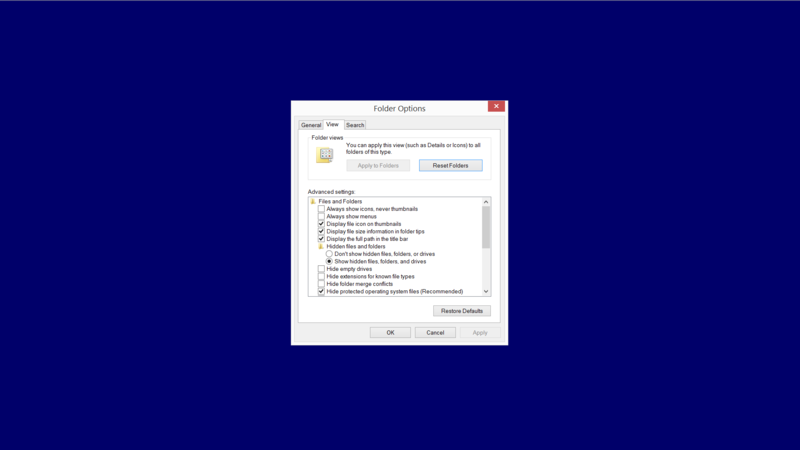 In Explorer/Change Folder Options, 'Show Hidden Files Folders and Drives' checked and uncheck 'Hide Extensions for Known File Types'. DO NOT run Kodi as admin. PDVD will popup "Disc not found, choose another". Adjust Refresh Rate to Match Video 'On start/stop'. Pause During Refresh Rate Change '8 Secs'. This is to give ample time for your panel to auto switch prefered 3D mode described later. Sync Playback to Display 'Uncheck'. With this setting enabled, you might experience repeated random audio drops using Dolby TrueHD as I have. Playback Mode of Stereoscopic 3D Videos 'Preferred Mode'. Disable Stereoscopic 3D Mode When Playback Ended 'Enabled'. Subtitle Position on Screen 'Below Video'. Stereoscopic 3D Depth of Subtitles '5'. Blu-Ray Playback Mode 'Simplified'. This will bring up the context menu 'Play with' allowing you to choose other than what is already focused as the default. You will simply press enter or navigate to your preference. 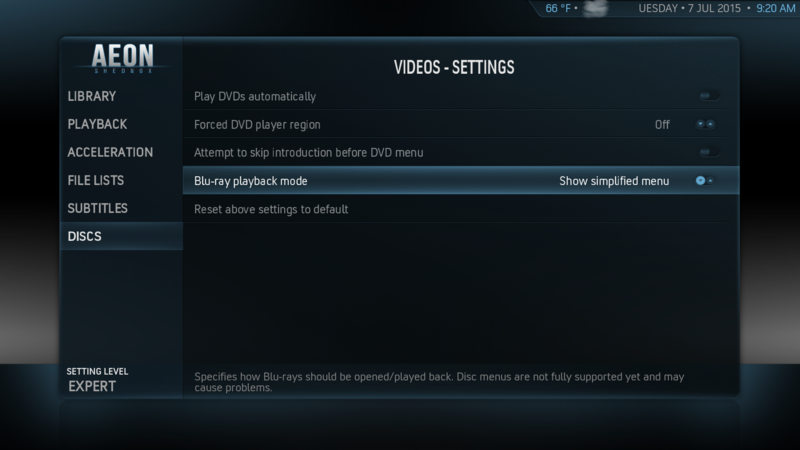 Blu-Ray Playback Mode 'Show Blu-ray menu'. This will skip the context menu and go directly to the correct player eliminating the extra 'enter' button press. You can still choose players by manually navigating to 'Play with'. 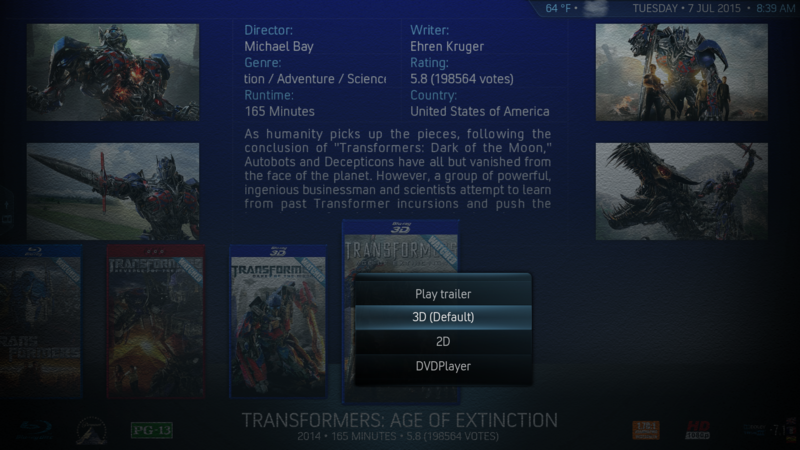 When you do the latter, and select play using with dvdplayer, KODI will show your title including Blu-ray menu, etc. Remember, some discs menus work perfectly within KODI and some do not. Stereoscopic 3D Mode (Current) 'Disabled'. Preferred Mode 'Same as Movie'. Use a Fullscreen Window Rather Than True Fullscreen 'Enabled' although Disabled using 1 display has presented no problems for me. I have read that using Kodi to adjust display size introduces ghosting. Always use your panels display size settings to fit to screen. 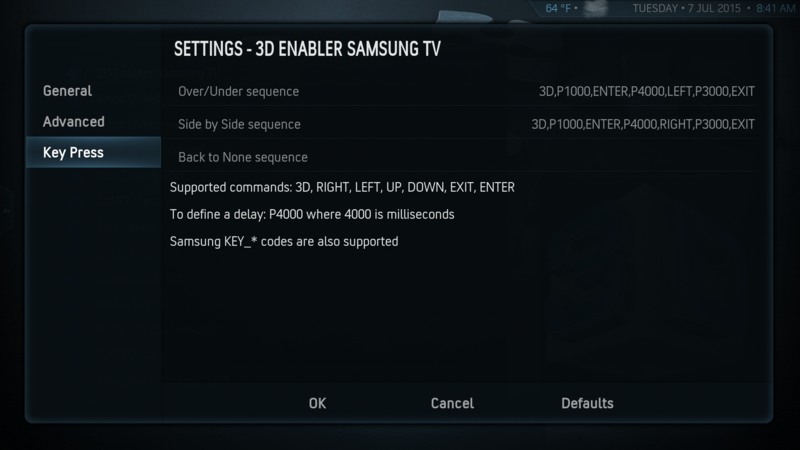 Install/Configure 3D Enabler Samsung TV 185212 (thread). I use this because I have a Samsung and it automates 3D mode so I don't have to select the proper one depending on the title I am playing. This is not needed for frame packed 3D titles such as full ripped iso's or file structure rips. Usually the only options are 2D>3D, SBS, and TAB. Full rips use none of these modes - .mkv's do. This also conforms with skins nicely so that cases show as 3D. We will be using a playercorefactory.xml and 2 .bat files. 1 for 2D and the other for 3D. If everything is setup correctly, your system will know which players to use for proper playback eliminating the need to choose from the context menu while still offering the feature. The options are 'dvdplayer', '2D', and '3D'. Some full rip 2D title menus are not supported in Kodi so an external player is used by default. However, you can still select the built in Kodi player (dvdplayer) through the context menu. Routinely, I start a title using the external player to take advantage of the different offerings in a complete blu-ray. Once I'm done watching previews and other offerings, I determine if there is a extended version or not. I then return to Kodi and context menu dvdplayer and play through Kodi so I can take advantage of the enhancements Kodi and various skins offer during playback that external players do not. So each player has it's benefits. Any format that is not a full blu-ray rip always defaults to dvdplayer. This includes 3D.mkv's since an external player is not needed and offers nothing more than Kodi's built in player. Full 3D ripped blu-rays will always default to the external player, mount via VCD, and your panel will prompt you to 'Turn on your 3D glasses' once everything is called up. The next post contains the codes you will need. The files you are about to create/modify are read and launched via Kodi. Some user input is required. Navigate to C:\Users\YOUR NAME APPEARS HERE\AppData\Roaming\Kodi\userdata. Create #1 .bat file as you did for the playercorefactory.xml. Name this PlayISO3D.bat and not PlayISO3D.bat.txt. Edit the following text into it and edit the drive letter you assigned to VCD. The example below shows A: presently. Here you can also edit the paths to .exe's if you use any different software. Remove this line of code if you don't use it. "C:\Program Files (x86)\SlySoft\AnyDVD\AnyDVD.exe"
Finally, create #2 .bat. Name it PlayISO2D.bat. Edit the following text into it and edit the drive letter you assigned to VCD. The example below shows A: presently. Here you can also edit the paths to .exe's if you use any different software. Remove these lines of code if you don't use it. "C:\Program Files (x86)\SlySoft\AnyDVD\AnyDVD.exe"
(2015-06-15, 22:19)brazen1 Wrote: This also conforms with skins nicely so that cases show as 3D. Thanks for the detailed post. Is there a list of these skins that show 3D cases? Or have a 3D mark? I really like eminence, but put my 3D movies in a different folder to seperate them from my 2D movies. I would rather they were all in the same folder with a 3D mark on some. You're quite welcome for the guide. I hope it helps you and others. I've always been fond of Aeon Nox and currently use Madnox and Shednox which show 3D titles clearly. Mixing and matching 2D and 3D in the same folder is not a problem. Just make sure '3D' is included in a titles name as the guide states. That is a nice wiki page. I don't see Madnox and Shednox on there. Since they are Aeon varients(?) they would have the same services? I put in for a wiki password, so I can suggest on the wiki page to include 3D adaptability in their chart Maybe even the HD and other markers too. Yes, because they are variants and very nice ones imo. I assume just about any skin can determine 3D, 2D, SD, HD, DVD, Blu-ray, etc. Kodi itself extracts information from the file and sometimes it must be played in order to start the extraction process. Skins tailor what to do with that information. "Markers" Kodi is unable to extract are hacked by adding to the file name such as Dolby Atmos and 3D. Skins show these "markers" as icons. We call them 'flags'. These flags are custom icons added to skins. Many times flags can be modified, created, or replaced with those the user prefers. Color, extended, B/W or combinations are possible. The amount of flags, if any, are also customizable. Aeon Nox makes these adjustments simple for the user in the GUI and perhaps other skins equally as nice, as well. It's great to have many choices since users are all unique. (2015-06-24, 17:22)brazen1 Wrote: Yes, because they are variants and very nice ones imo. I assume just about any skin can determine 3D, 2D, SD, HD, DVD, Blu-ray, etc. Kodi itself extracts information from the file and sometimes it must be played in order to start the extraction process. Skins tailor what to do with that information. "Markers" Kodi is unable to extract are hacked by adding to the file name such as Dolby Atmos and 3D. Skins show these "markers" as icons. We call them 'flags'. These flags are custom icons added to skins. Many times flags can be modified, created, or replaced with those the user prefers. Color, extended, B/W or combinations are possible. The amount of flags, if any, are also customizable. Aeon Nox makes these adjustments simple for the user in the GUI and perhaps other skins equally as nice, as well. It's great to have many choices since users are all unique. This is all great info. Thank you so much. I have Kodi Wiki editing privileges now, and suggested they expand their chart in discussion. Hopefully I will have time to try out Shednox next week. I added all my ISO's to PowerDVD 15 just to give it a whirl, and it pretty much crashed the program. So I will be keeping KODI as my movie database, and PowerDVD as the external player when needed. I've updated this thread to include pictures and help simplify the process. Is there a way to get the video to display on the tv only? It only works for me when i'm duplicating the screen to the tv. If I try to select second screen only Total movie theater complains i'm guessing due to hdcp? My surface pro 2 runs hot when duplicating. Was hoping to turn the screen off while being able to watch on the tv. Is there a way to get the video to display on the tv only? Yes, follow the instructions carefully. It only works for me when i'm duplicating the screen to the tv. Why are you limited to duplicating? You shouldn't select Duplicate. You should select PC Screen Only as the guide shows in picture #4. If I try to select second screen only Total movie theater complains i'm guessing due to hdcp? What does "complains" mean? Again, you shouldn't be selecting 2nd screen. Select PC Screen Only. If TMT or PDVD open on the wrong screen, drag it to the correct screen in windowed mode, put it in full screen and close it. It should remember it's position next time it opens. By selecting PC Screen Only, it will have no choice but do this automatically since it will be the only screen available until it is shut off and automatically reassigned to your surface pro 2. My surface pro 2 runs hot when duplicating. Then you have a hardware problem and/or limitation. I don't have a surface pro 2 to test why for you but you shouldn't be duplicating anyway. Was hoping to turn the screen off while being able to watch on the tv. There is nothing to hope for. That is exactly what occurs once you tailor your system properly. If you're cutting some corners or deviating from the guide to suit your needs, there is also a switch in Kodi settings to blank monitors not in use. It does not turn the monitor off, it only dims it black. (2015-07-07, 19:07)brazen1 Wrote: I've updated this thread to include pictures and help simplify the process. I switched skins to Aeon to be as compatible as possible with your guide. Movies start up fine. For example, I have Gravity 2D and Gravity 3D. They each start up in correct mode. But there is no flag or marker in Aeon to indicate which one is 3D. Would you know why? Maybe not in all styles of view? Also, I can switch between displays in Windows 7 just fine. 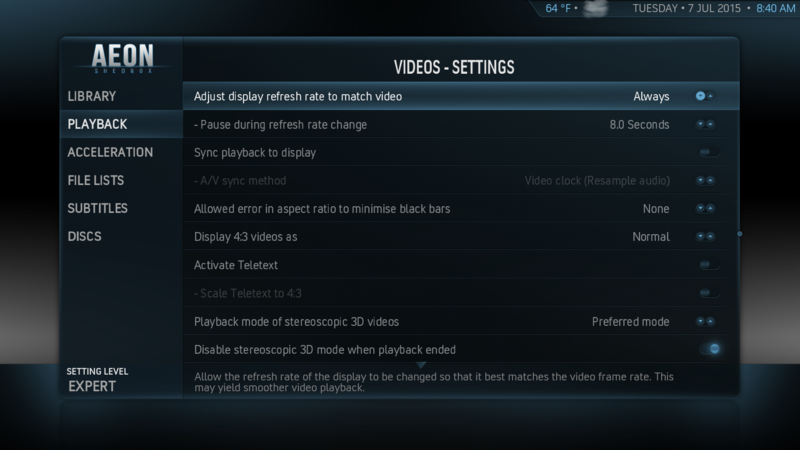 But I do not see the option, 'enable stereoscopic settings for all 3D displays'. I believe I have followed your guide in that area carefully a couple of times, but do not see it - I will try again. Do you think the reason could be that I have Windows 7? I am thinking of switching to windows 8.1 to get that option. That would be a nice feature to have. Also, I do not have an Nvidia card. I use the Intel HD3000 native graphics' with HDMI. That works fine for 3D, but, maybe that is why I don't get the 'enable stereoscopic settings for all 3D displays' option. I can toggle that option with <cntrl><alt>F5. You have pointed out features I did not existed. Thank you for your hard work! There are plenty of skins that have a 3D indicator on their poster covers. I use and enjoy MadNox. I know of no reason to have a 2D and a 3D version of the same movie. You can play a 3D title in 2D simply. Press C to bring up the context menu for a title and select 'Play Using' and then select 2D (using your external player) or dvdplayer (using Kodi internal player). Some blu-rays have a 3D or 2D option in it's menu as well. TMT and PDVD also have toggles. 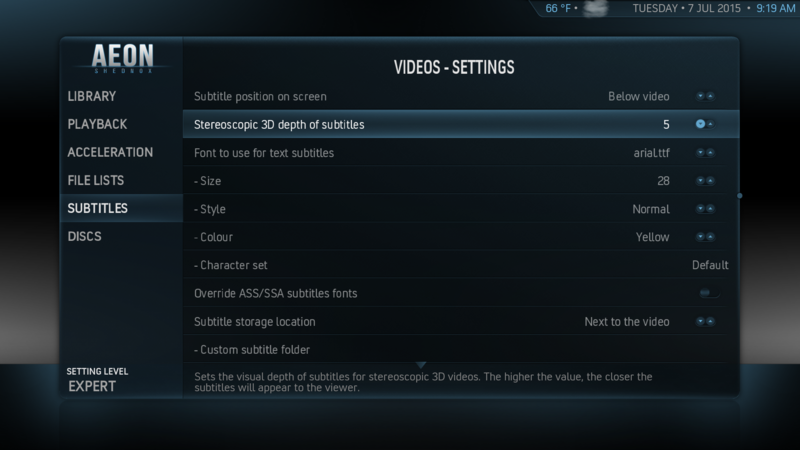 To play a 3D.mkv in Kodi 2D, you would need to navigate to Settings/Video/Playback/Playback Mode of Stereoscopic/ and select 'ask me' or 'mono/2D instead of 'preferred mode'. I think 7 has this setting but not sure since I'm on 8. You shouldn't need to upgrade. 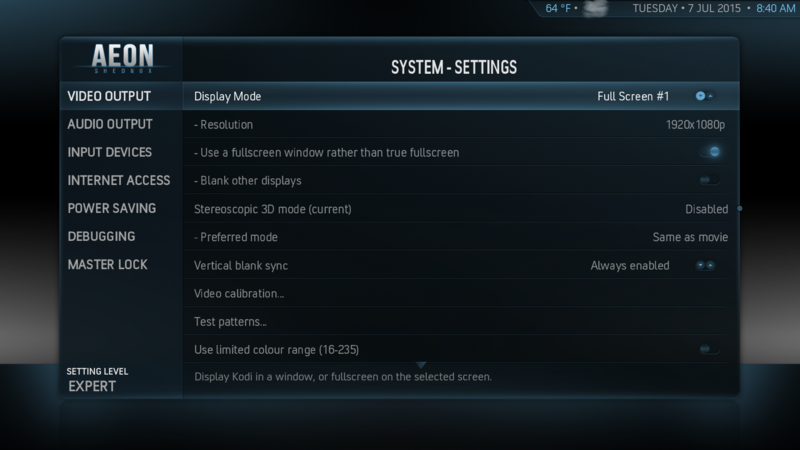 Make sure you are on the display that has 3D capability when adjusting the Windows Screen Resolution setting. It may not appear on your 2D limited PC monitor. The setting is going to be unchecked remember. There is a line of code that toggles that switch auto on/off for you because you do not want it enabled until you are actually watching something in 3D. Since 'enable stereoscopic settings for all 3D displays' is a Windows switch, there should be no difference Nvidia vs. Intel. However, since the code toggles 3D on and off via the Nvidia software, it will not be coded for Intel. If you research where the 3Dtoggle.exe (this is not the actual name but what it is) location is for Intel software (if it exists) I can add it for you simply so it's automated like Nvidia. I have no Intel GPU to try for you. I assume you are able to manually put your set in 3D mode and still function ok until then. 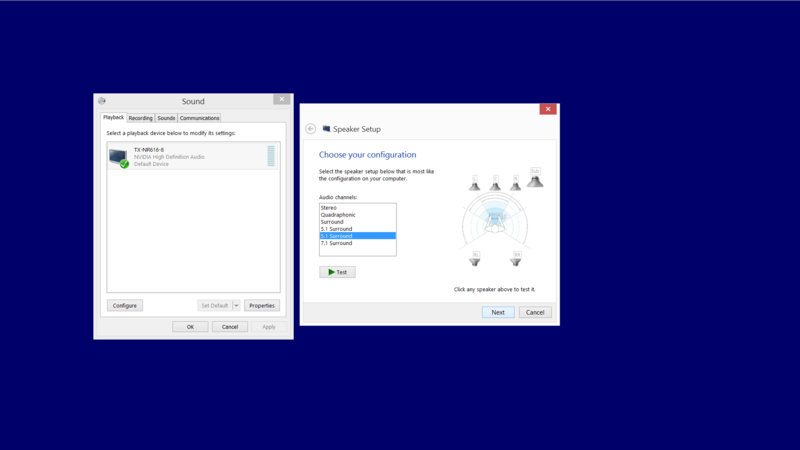 (2015-07-24, 01:55)brazen1 Wrote: Since 'enable stereoscopic settings for all 3D displays' is a Windows switch, there should be no difference Nvidia vs. Intel. However, since the code toggles 3D on and off via the Nvidia software, it will not be coded for Intel. If you research where the 3Dtoggle.exe (this is not the actual name but what it is) location is for Intel software (if it exists) I can add it for you simply so it's automated like Nvidia. I have no Intel GPU to try for you. I assume you are able to manually put your set in 3D mode and still function ok until then. I have looked for 'enable stereoscopic settings for all 3D displays' while switched to the TV and switched to the PC monitor. I think I have tried every combination. But since you feel I should be able to find it, I will look again. To be clear: When the TV detects a 3D stream, it switches automatically. All my blu rays are iso's. The problem is, I have to manually switch to "Display 1" in windows, which switches off the PC monitor. Then I use the mouse on the TV screen to confirm the settings. it is inconvenient. I'll do the research you suggest. PowerDVD is set to "Play 3D movies as 3D". So switching 3D on and off isn't an issue - switching to the TV to allow the 3D to work is the issue. And I believe you are saying that can be automated.